Music in The Legend of Zelda series is, well, legendary. From the old standards we’ve come to expect, like the Hyrule Fanfare, Zelda’s Lullaby, or the Master Sword’s theme, to rarer tunes like title and character themes or boss tracks, almost all of the Zelda musical canon holds some special memory for fans everywhere. One of the time-honored traditions of the series is to incorporate old musical tracks, redone for a newer game’s atmosphere, and with rumors that Skyward Sword is going to use a live orchestra soundtrack, the prospect of returning songs is really exciting. While of course new music is always awesome, here are a few songs that I think really deserve some attention. Zelda II was the first game in the series that didn’t have music direction from Koji Kondo, with composition instead being handled by Akito Nakatsuka. This is pretty astounding since it was only the second game in the series and, quite frankly, its soundtrack was pretty awesome. One example is the memorable title theme, which really set the adventuresome tone of the game. After Twilight Princess used a reworking of the original Legend of Zelda title theme for its intro, could a comeback of the Zelda II theme actually find its way into Skyward Sword? If Super Smash Bros. could re-popularize this classic track, why not put it back in a real series game? The Palace Theme is truly a testament to how excellent Nakatsuka was at gauging the emotions of areas and moments in gameplay. Doesn’t it make you feel like you’re in a dungeon full of monsters? It’s really no surprise that this track was right at home in a fast-paced fighting game like Smash Bros.
Heck, they could rip that song straight from Brawl and slap it into a dungeon and I’d be more than happy with it. All right, here ends my whoring of Zelda II songs. This track is just brilliant, and while the entire Link’s Awakening soundtrack follows suit, this one totally eclipses the rest. I love the epic feel – and by “epic” I don’t mean “awesome” (or maybe I do), I’m talking epic in the heroic adventure sense. It’s the same feel I got from the Lord of the Rings soundtrack, except this song’s loads more dynamic. Blows that Goron Theme out of the water as an atmospheric mountain-climbing track. While I actually really doubt this track will ever show again, this exemplifies what Zelda music should be – atmospheric, dynamic, memorable. Okay, yeah, this one sort of got a treatment in Twilight Princess, but it was much subtler and more subdued, and mismatched with the Kakariko theme song anyway. (The Smash Bros. remix didn’t quite do it justice either.) No, when I say I want the Dark World Theme remixed, I mean it should make a triumphant return in all its glory. It doesn’t have to be tied with the Dark World per se (and I doubt Skyward Sword will have anything to do with the Dark World anyway) – in fact, I’d rather it come back as a powerful overworld track, which is ultimately what it turned out to be in its original context. This is another one of those awesome climactic tracks, and the one I think would best well in Skyward Sword given its style and what we’ve seen so far of the combat pacing. Something about the rhythm and tempo makes me feel like I should be directing pinpoint slices at certain intervals to cut down enemies. And, yeah, this song was brought back in Four Swords Adventures, but that whole game was based on A Link to the Past. 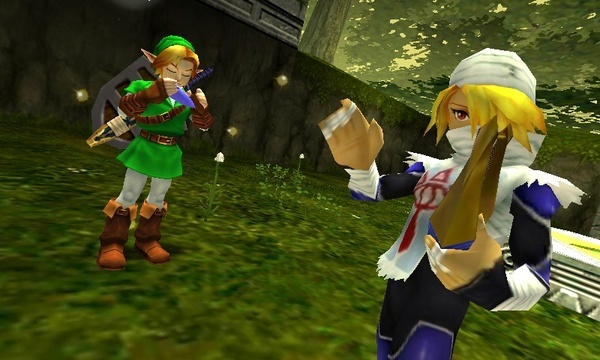 Given how much Aonuma loves A Link to the Past, I think he’d be more than happy to give it some limelight in a full-blown big-budget Zelda game. This is just the remix side of things – of course it’s important that the original music for Skyward Sword be just as excellent, if not more so. I’m not too worried – with rare exceptions, Zelda soundtracks have always been top-notch and about as iconic as video game music can get – but I acknowledge nonetheless that the team should always shoot higher and that there’s a wealth of those iconic songs that Nintendo can and should draw upon for the next installment. But these are only my picks – what about yours? Let us know what songs you’d like to see redone in the comments section – or, even better, discuss prospects for returning Zelda music on our forums!